Can I Nominate a company if I’m not an employee or executive of the company? Marketing professionals and public relations agencies may make nominations on behalf of their cybersecurity clients. Any individual, board member, investor, management team member or their staff involved in building a cybersecurity company may nominate their company. However, the one page nomination form needs to be complete and up to date. The more information properly filled out in this form, the better for our judges and your potential scoring. Are there multiple categories like the InfoSec Awards or Global Awards? No. There is only one category – Black Unicorn. Unlike the InfoSec Awards or Global Awards, both focusing on innovations in numerous cybersecurity categories, the Black Unicorn award is in a category by itself. Winning signifies that your company has the potential to reach a $1B valuation in the cybersecurity marketplace. Why should I nominate my Company for a Black Unicorn Award? The Black Unicorn Awards brings a unique distinction of being vetted by three top cybersecurity trailblazers, experts and investors. A Black Unicorn Award is among the most prestigious awards in the cybersecurity industry. Winning represents significant value. Whether you are a non-finalist nominee, a finalist or a winner, there are sizable benefits for everyone. Being nominated highlights your incredible potential and an unbiased endorsement if you win. Our Judges are shaping the future of Cybersecurity and the world is watching and listening to them. Is there a fee to apply for a Black Unicorn Award? Yes, there is a one-time entry fee , which will be used for significant awards program marketing, related operating costs and to defray the expenses of the judging, delivering the winner hotseat videos, podcasts and administrative processes involved in awarding the Black Unicorn Awards. This fee is insignificant in comparison of being named a finalist or winning a Black Unicorn Award. Will taking advantage of the marketing program between now and Black Hat USA 2019 help me win? No, however we did create a special marketing program for those who enter this contest at an incredible one-time discount to help create additional demand for your business. The Cyber Defense Media Group has a suite of marketing platforms to help you reach your target audience (CEOs, CFOs, CISOs, CSOs, CIOs, IT Executives, InfoSec Buyers, IT and Cyber Security Professionals, SOC and Data Center Staff and Network Administrators). Our leading platform is CyberDefenseMagazine.com with over 140k unique visitors each month and growing, daily. We have other growing media outlets including CyberDefenseTV.com and CyberDefenseRadio.com. Here’s an example of our stats, right now: https://essentials.news/en/future-of-hacking in the #1 Position! 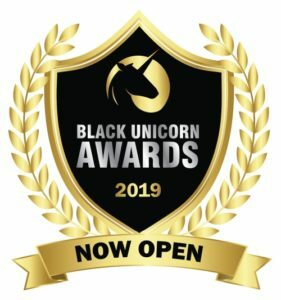 Between April 15, 2019 and August 7, 2019 you have the opportunity to spread the word that you are nominated for a Black Unicorn Award and will be attending Black Hat USA 2019. Learn more about this marketing program, here. What is the Schedule for the Black Unicorn Awards 2019? All Official Nomination Forms must be received by the Judges at nominations@blackunicornawards.comno later than June 19, 2019. What is the definition of a Black Unicorn? In the venture capital industry, a unicorn refers to any tech startup company that reaches a $1 billion dollar market value as determined by private or public investment. The term was originally coined in 2013 by venture capitalist Aileen Lee, choosing the mythical animal to represent the statistical rarity of such successful ventures. Last year, CB Insights reported that the odds of becoming a unicorn — a company valued at $1 billion or more — was less than 1% for companies that had raised venture capital. In 2018, there were 47 tech companies in the US to reach this unicorn status, according to data provided by PitchBook. In the cybersecurity industry, in 2019, Gary S. Miliefsky coined the term black unicorn as a cybersecurity company that has the potential to reach a $1 billion dollar market value as determined by private or public investment. The black unicorn awards are designed to help showcase companies with this kind of potential. Ultimately, the judging in our awards is tough and its still up to the finalists and the winners to execute a flawless business model to reach this potential. It takes innovation, dedication, passion – the right team and the right cyber security solution, harmoniously executed to become a unicorn. If you are one of our winners, the judges believe you have this potential. While there are no guarantees, your discovery and our award signify you meet the criterial – it’s up to you to execute and meet all the challenges that follow.